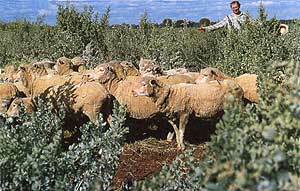 It is with good reason that we are known as Grazing Management Systems: we are one of the most experienced and knowledgeable sources for proper dryland grazing practices in Australia, whether it is with Oldman saltbush or with more traditional fodder crops; whether it is with sheep, cattle or less common animals. Grazing practices are, as anyone involved in the land knows, a critical component in any agribusiness involving livestock. It affects everything from soil regeneration, animal health, feed costs and countless other issues which can have a devastating impact. Simply letting the livestock "do as they please" is a recipe for disaster in almost all cases. With Oldman saltbush, grazing issues become even more vital: the plant must be grazed in a specific manner to ensure optimal results. However, this manner can vary with issues such as weather, the age of the herd and the availability of water. Only Grazing Management Systems has the unmatched experience to ensure that whatever your situation, the right advice is given to ensure success. Even if you do not currently utilize Oldman saltbush, you can still benefit from our advice: we can provide assistance to you for all types of fodder crops in a wide variety of soil types and climatic conditions. Our experience on many properties has taught us the best way to integrate Oldman saltbush grazing practices with those of other crops, giving you tremendous flexibility in deciding how to focus your agribusiness goals. Grazing is a vital part of making Oldman saltbush work for you: let the expertise of Grazing Management Systems make it work even better.